Bitcoin led a tremendous market rally this morning, rising through the turgid $4,200 level of resistance like a knife through butter before spiking all the way up to $5,150. The move to the upside comes after a prolonged period of low volatility, with Bitcoin having remained in a tight range since the breakdown from $6,150 in November. The $5,150 level of resistance is key – Bitcoin used that level as support in October 2017 just months before rallying to an astonishing all-time high of $20,000. The 200 exponential moving average (EMA) on the daily chart is currently residing at around $4,600. If Bitcoin can continue its momentum and stay above this level, it could well be showing the first signs of a reversal since the climactic fall from grace in 2018. Is the bear market finished? It’s too early to say whether the cryptocurrency market has reversed into a bull phase. The $5,150 and $5,850 levels remain key moving forward. If Bitcoin can continue its upside move through these levels, it could well spell the start of a bull market. However, it’s easy to forget in the haze of euphoria where in fact the cryptocurrency market is today. Bitcoin is still 75% down from it’s all-time high, with several altcoins dealing with more than 90% reductions in value. Bitcoin led the way during 2017’s bull market, with altcoins being sold off and the profits reinvested in the industry’s main cryptocurrency as it spiked to incredible heights. 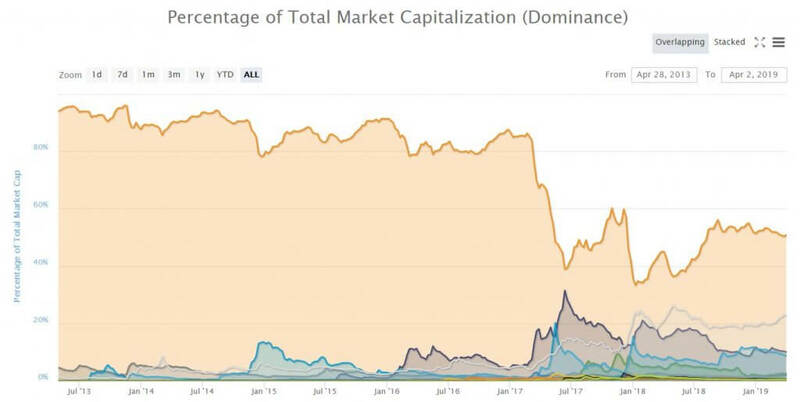 This morning, we saw Bitcoin’s market dominance rise 2% to 52%, with numerous altcoins falling up to 8% against their Bitcoin pairs. It will be interesting to see whether profits flow back into altcoins or if bulls show signs of exhaustion with price falling back below the 200 EMA on the daily chart. This morning, Bitcoin buy volume on Binance toppled the previous all-time high by rising to $342 million. Liquidations on BitMEX also saw a quite incredible spike, with more than $500 million in short positions being liquidated, causing price to cascade to the upside. Cryptocurrency market volume has seen a steady rise over the past week, averaging around $33 billion per day earlier this week before hitting $44 billion this morning. This signified not only a rise in open-interest but also a switch in sentiment, which could be another sign that a bull market is coming. If upside momentum continues, Bitcoin could well re-test $5,150 before going to tap at the door of $5,900. The latter level held for four months before a spectacular fall from grace in November. Once support is broken it will turn into resistance, so moving forward this level will be key. If price does move through the $6,000 level, positive sentiment around cryptocurrencies leading up to the SEC’s ETF decision in December could reach levels not seen since 2017. If price rejects here, downside targets remain at $2,800, $1,850, and $1,150.